The staff were all super friendly and even adding a room and asking for adjoining in a full hotel they were able to accommodate my request! Rooms were super clean. I would definitely go back here! It was very clean and safe. My room was comfortable. Where to find Durham hotels near an airport? Where can I find hotels in Durham that are near tourist attractions? You will find yourself simply spoiled for choice when it comes to finding the perfect places to base yourself in Durham. Expedia's comprehensive database has 31 hotel options within a 0.1-kilometre (0.06-mile) radius of downtown Durham. 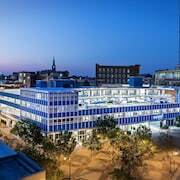 Some of the more central accommodation options of downtown Durham are the Durham Marriott City Center and 21c Museum Hotel Durham. For a hotel located in the vicinity of the Duke University, you could investigate the The King's Daughters Inn or the Washington Duke Inn & Golf Club. The The King's Daughters Inn is 2 kilometres (1 mile) away and the Washington Duke Inn & Golf Club is 1 kilometre (1 mile) away. If you have to be mindful of your budget and are simply looking for the more affordable Durham hotels, there are also quite a few affordable hotels available in the vicinity. 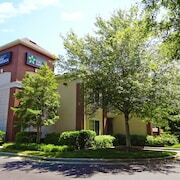 7 kilometres (4 miles) away from Durham's center you'll find the Extended Stay America - Durham - University - Ivy Creek Blvd. 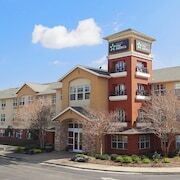 The Comfort Suites Raleigh Durham Airport/Research Triangle Park is just 14 kilometres (9 miles) away. The Millennium Hotel Durham and the Comfort Inn University Durham - Chapel Hill are two of the other recommended economical options worth looking into. 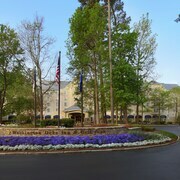 20 kilometres (14 miles) from downtown Durham, is the The Umstead Hotel and Spa. The Renaissance Raleigh North Hills Hotel is located 30 kilometres (18 miles) away. 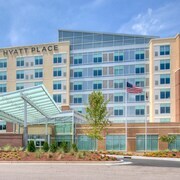 If you'd prefer, you could check out the rates and amenities at the Arrowhead Inn or the Raleigh Marriott City Center. Like to travel a little further afield? Eastern Piedmont has a number of things to see. Visit Eastern Piedmont's historic mansions and also enjoy the area's tablelands. Common pastimes in this part of United States of America include cycling and shore fishing. 17 kilometres (10 miles) away from Durham you will find Chapel Hill, where you can enjoy University of North Carolina and Morehead Planetarium. Chapel Hill accommodation options include the The Franklin Hotel Chapel Hill - Curio Collection by Hilton and The Carolina Inn - Destination Hotels & Resorts. Or stay in Cary, 25 kilometres (16 miles) to the southeast of Durham, where you can choose from the Embassy Suites Raleigh - Durham/Research Triangle and Hilton Garden Inn Raleigh Cary. If you're staying in Cary, be sure to check out the Cary Towne Center and Crossroads Plaza. Located 17 kilometres (10 miles) away from Durham is Raleigh - Durham International Airport. Stay nearby at Embassy Suites Raleigh-Durham Airport/Brier Creek or Hampton Inn & Suites Raleigh-Durham Airport-Brier Creek. What are the most popular Durham hotels? Are there hotels in other cities near Durham? What other types of accommodations are available in Durham? Explore Durham with Expedia.ca’s Travel Guides to find the best flights, cars, holiday packages and more!